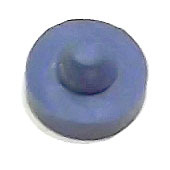 1-inch round blue rubber bumper with mounting plug on back side. Used in ball troughs and at end of plastic or metal ramps on some later-model games. Also replaces Williams # 23-6686.